I know what your thinking Kimbo; we're about to offer you a free slice for some reason or another. This is not what we're looking to do here. Granted if you accept you will be welcome to a lifetime supply of pizza slices. Here's the proposal, we have two options here. 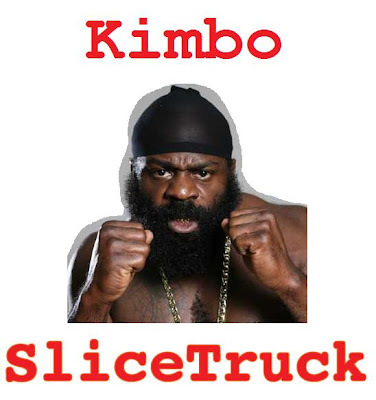 First, legally change your name from Kimbo Slice to simply SliceTruck. This falls perfectly in line with your image of a tough, fierce, fighter guy, SliceTruck, say it to yourself and imagine a beautiful woman is saying it to you because that's your name and she wants you. Sounds good, right. Now think of that same beautiful woman lustily whispering Hey Kimbo Slice. Not that interesting anymore, somethings missing. So think that over and remember we all believe it would be for the best for you, but if a one word name isn't for you, we have another option. Keep Kimbo and change your last name to SliceTruck. Kimbo SliceTruck. Now everyone is finally getting the full picture with that. No more leaving people hanging, thank you your welcome. We realize your a big celeb and these type of endorsements don't come cheap so we're prepared to offer you a contract in which you're paid. Sound good? No, it sounds great. You've seen the contract, now its your move. We're waiting.